Electrical heaters where electrical energy is converted resistively into heat. Propellants where chemical energy is the source. 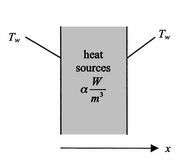 These situations can be analyzed by looking at a model problem of a slab with heat sources (W/m3) distributed throughout. We take the outside walls to be at temperature and we will determine the maximum internal temperature. 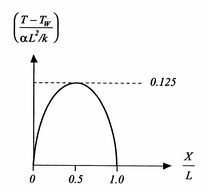 This distribution is sketched in Figure 18.2. It is symmetric about the mid-plane at , with half the energy due to the sources exiting the slab on each side. This is half of the total heat generated within the slab. The magnitude of the heat flux is the same at , although the direction is opposite. 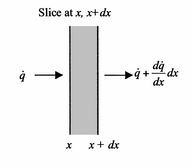 Evaluating (18.6) at and allows determination of the two constants and . This is left as an exercise for the reader.